As readers will be aware, NAP uses Tier II and Tier I (more hazardous and most hazardous) herbicides. If the Significant Natural Areas Program (SNRAMP – Sin-ramp) is implemented, pesticide use will rise even more than it has done so far (the graph shows annual number of applications between 2008 and 2011). Yet the Draft Environmental Impact Report (DEIR) doesn’t say anything about how much or how frequently herbicides will be used; it makes mistakes about which herbicides are going to be used; and provides practically no information on the ones NAP currently uses. And of course it promises that NAP will comply with the restrictions of the SF Department of the Environment without acknowledging that NAP has violated these restrictions quite a few times. The DEIR claims that herbicide applications by the Natural Areas Program comply with San Francisco’s Integrated Pest Management (IPM) Ordinance. In fact, the public record contains considerable evidence that herbicide applications by the Natural Areas Program frequently violate San Francisco’s IPM Ordinance. The DEIR provides no information about the increased use of herbicides that will be required to prevent the resprouting of the trees that will be destroyed by the implementation of SNRAMP. It is eight years out of date. Since we aren’t informed by the DEIR of the volume of SFRPD’s pesticide use, we are unable to determine the volume of NAP’s pesticide use, i.e., NAP’s pesticide use is 10% of WHAT? We aren’t reassured by the claim that NAP’s pesticide use is only 10% of total RRPD pesticide use—if in fact that is true. The public has good reason to expect that parks designated as “natural areas” should contain less pesticide than other park areas, such as golf courses, lawns, flower gardens, and landscaped areas. We learn from these official reports of NAP’s pesticide use which are required by the City’s IPM Ordinance, that NAP’s pesticide use has increased 330% since 2008. Therefore, the only information provided by the DEIR regarding NAP’s pesticide use is inadequate and inaccurate because it is eight years old and pesticide use by the Natural Areas Program is increasing significantly from year to year, 330% in the past four years alone. According to the official reports of NAP’s pesticide use, Garlon (active ingredient triclopyr) was used more often than any other pesticide until 2011. While use of Garlon decreased in 2011, it is still being used according to Pesticide Application Notices posted in the natural areas in 2012. The DEIR claims that glyphosate is the “primary product used.” (DEIR, page 365). This statement is inaccurate. Official reports of NAP’s pesticide use prove that triclypyr was used more often than glyphosate until 2011 when imazapyr was used as frequently as glyphosate. 2. THE DEIR PROVIDES NO INFORMATION ABOUT IMAZAPYR WHICH IS CURRENTLY THE MOST FREQUENTLY USED HERBICIDE. For the most part NAP substituted a mixture of glyphosate and imazapyr for Garlon in 2011. Is this an improvement? Maybe not. Although glyphosate and imazapyr are assigned a lower hazard rating of “More Hazardous” by the Department of the Environment, the Natural Areas Program increased their pesticide applications in 2011 at least 20% compared to 2010. But more importantly, little is known about the toxicity of imazapyr and nothing is known about the toxicity of combining glyphosate and imazapyr. [Ref: “Aquatic Pesticide Application Plan for the San Francisco Estuary Invasive Spartina Project,” August 2010, page 32.] Imazapyr was approved for use in California in 2005, so only the minimal tests required by law have been done on it. THE NATURAL AREAS PROGRAM IS USING IMAZAPYR FOR A PURPOSE DIFFERENT FROM THAT FOR WHICH IMAZAPYR WAS EVALUATED. The “Aquatic Pesticide Application Plan for the San Francisco Estuary Invasive Spartina Project” is cited by San Francisco’s IPM program as the evaluation upon which it based its decision to add imazapyr to the list of pesticides approved for use in San Francisco in 2010. Was it appropriate for the city’s IPM program to use the evaluation of imazapyr for the Spartina project as the basis of their decision to approve its use by the Natural Areas Program? We don’t think so. The circumstances of the Spartina project are substantially different from those of its use by the Natural Areas Program. Imazapyr is used to eradicate non-native Spartina in a tidal estuary. For that reason the evaluation of its use assured the public that this herbicide would not accumulate in the environment because it would be flushed away from the ground by the tide twice each day. The evaluation also said that when imazapyr was used in a pond or stable water source, it persisted in the ground for a longer period of time. In fact, that’s exactly how imazapyr is being used by the Natural Areas Program. It has been used at Lake Merced and at Pine Lake, both stable water sources. It is also being used in Glen Canyon Park, which is a watershed. We don’t assume that imazapyr is being used safely to eradicate Spartina. However, even if it is, it does NOT follow that it is safe for use in watersheds that are not tidal, such as those being sprayed by the Natural Areas Program. The manufacturer’s labels for imazapyr and glyphosate suggest that combining them is not an approved use. The manufacturer’s label for Aquamaster (glyphosate) does not include imazapyr on the list of pesticides with which it can be safely combined. And the Polaris (imazapyr) label says that it should not be combined with another pesticide unless it is expressly recommended by the manufacturer of that pesticide. The evaluation of imazapyr for the Spartina eradication project explained why imazapyr is being combined with glyphosate by the non-native Spartina eradication project. Imazapyr is apparently slow acting. It can take some months to kill the plant on which it is sprayed. Glyphosate, on the other hand, is fast acting. The plant on which it is sprayed begins to yellow and die within a few weeks. Glyphosate is therefore used by the Spartina eradication project to provide quicker feedback to those spraying the herbicide. They know within a few weeks if they have sprayed in the right place. They don’t have to wait for the next season to spray again if necessary. However, glyphosate should be applied to perennial broadleaf plants during their reproductive stage of growth, when they are budding in the late spring and summer, according to the manufacturer. 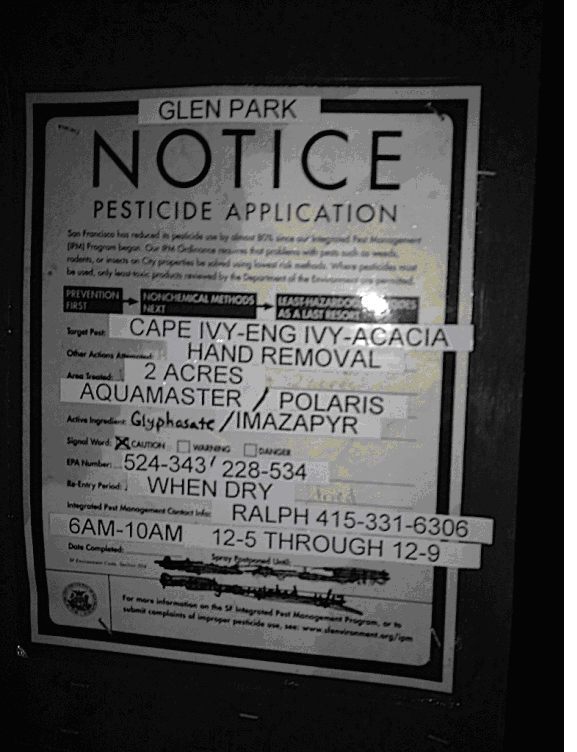 In Glen Canyon Park, a mixture of glyphosate and imazapyr was sprayed on ivy in December 2011, clearly not the recommended time period for spraying. A month later, there was no indication that the ivy was damaged by this spraying. This suggests that it was unnecessary to combine glyphosate and imazapyr in this application. The public was exposed to the unnecessary risk of combining these herbicides, with no potential benefit of taking that risk. Glyphosate is a non-selective herbicide. That is, it kills any plant it is sprayed on at the right stage of its growth. But imazapyr is far more insidious as a killer of plants because it is known to travel from the roots of the plant that has been sprayed to the roots of other plants. For that reason, the manufacturer cautions the user NOT to spray near the roots of any plant you don’t want to kill. For example, the manufacturer says explicitly that imazapyr should not be sprayed under trees, because that tree is likely to be killed, whether or not that was the intention. Much of the ivy that was sprayed by the Natural Areas Program in Glen Park in December 2011 was sprayed under willow trees. The willow trees are native, so it seems unlikely that they intended to kill them. The Federal Drug Administration recently banned some use of antibiotics in domesticated animals because the bacteria antibiotics are intended to kill are developing resistance to the antibiotics. This resistance is becoming increasingly dangerous to humans who are also the victims of those bacteria. Antibiotics are being rendered useless by overuse on domesticated animals. When humans need them, they won’t work because bacteria have developed a resistance to them. Likewise, plants and animals are also capable of developing resistance to pesticides. Glyphosate is the most heavily used herbicide in agriculture. Recent research indicates that weeds are developing resistance to glyphosate. The manufacturer of imazapyr says explicitly that repeated use of this herbicide is likely to result in resistance to it over the long term: “When herbicides with the same mode of action are used repeatedly over several years to control the same weed species in the same application site, naturally occurring resistant weed biotypes may survive…propagate and become dominant in that site.” So, does it make sense to use imazapyr on a plant as persistent as ivy? If it is indeed necessary to eradicate ivy—and we doubt that it is–pesticides do not have to be used to do it. The Audubon Canyon Ranch in Bolinas Lagoon reported “qualified” success using hand-pulling methods on 5 acres over 5 years “utilizing 2375 volunteer hours.” Biannual monitoring of resprouts will be required for the foreseeable future. It’s a big commitment, but at least it is safe. To conclude this section, we do not believe that imazapyr should be used in non-tidal watersheds. Nor do we believe it should be combined with glyphosate. In any case, the manner in which it has been used by the Natural Areas Program is not consistent with the manufacturer’s recommendations regarding its use. NAP has been granted exceptions to the IPM Ordinance to use toxic chemicals that are not used by other agencies in San Francisco: imazapyr and triclopyr. 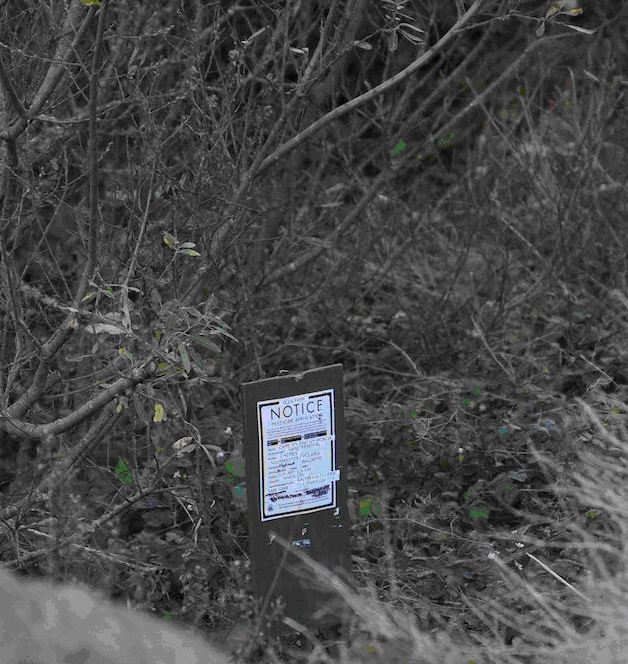 We have photographs of notices of pesticide applications for which there are no corresponding entries on the official record of pesticide use maintained by the Department of the Environment. This suggests that the official reports of NAP’s pesticide use are not complete. These photographs have been sent to the Department of the Environment. NAP’s notices of pesticide application are frequently missing the date of application, thereby making it impossible for the public to know when the area is safe to enter. Photographs of these incomplete notices have been sent to the Department of the Environment. 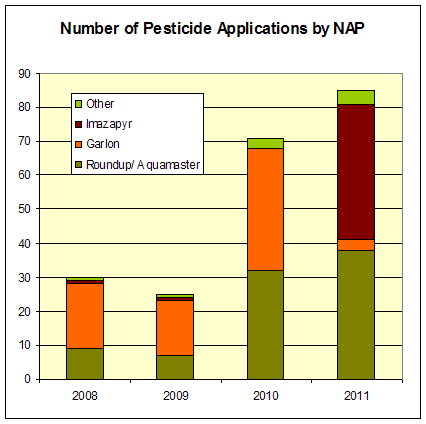 NAP used imazapyr in 2008 and 2009, prior to its approval for use by San Francisco’s IPM policy in 2011. NAP sprayed Garlon (triclopyr) prior to 2011 when only “dabbing and injection” were approved application methods by the IPM policy. NAP sprayed herbicides containing glyphosate in the water of Lake Merced which is officially designated red-legged frog habitat in violation of US Fish and Wildlife regulations which ban the use of many herbicides, including glyphosate, from designated habitat for red-legged frogs and other endangered amphibians. Volunteers working in the natural areas are not authorized to use herbicides because they have not been trained and do not have the proper equipment with which to safely apply herbicides. Some of these unauthorized volunteers have been seen spraying herbicides without posting the required notification of pesticide application. These incidents have been reported to the Department of the Environment. This flagrant misrepresentation of the toxicity of Garlon is appalling. The DEIR contains no accurate information about the toxicity of any of the pesticides used by the Natural Areas Program. In the only case in which it provides any information, it resorts to egregious lies. The Mission Blue butterfly is a federal endangered species which existed historically on Twin Peaks in San Francisco. San Francisco’s Natural Areas Program has been trying to reintroduce the Mission Blue to Twin Peaks for several years, so far with limited success. This reintroduction effort is reported by the DEIR. Herbicides are being sprayed on Twin Peaks to control non-native vegetation. Twin Peaks was sprayed with herbicides 16 times in 2010 and 19 times in 2011. A recently published study reports that the reproductive success of the Behr’s metalmark butterfly was significantly reduced (24-36%) by herbicides used to control non-native vegetation. [Ref: John D. Stark, Xue Dong Chen, Catherina S. Johnson, “Effects of herbicides on Behr’s metalmark butterfly, a surrogate species for the endangered butterfly, Lange’s metalmark,” Elsevier, 1/11/12.] Two of those pesticides are used on Twin Peaks, imazapyr and triclopyr. Triclopyr was used most often on Twin Peaks in 2010 and imazapyr in 2011. The study does not explain how this harm occurs. It observes that the three herbicides that were studied work in different ways. It therefore speculates that the harm to the butterfly larva may be from the inactive ingredients of the pesticides which they have in common, or that the harm comes to the larva from the plant which is altered in some way by the herbicide application. Either theory is potentially applicable to the herbicides used on Twin Peaks and consequently harmful to the Mission Blue. The Endangered Species Act requires that the Natural Areas Program stop spraying these herbicides on Twin Peaks because they are known to be harmful to the reproductive success of butterflies. Unless further scientific study exonerates these herbicides, the law obligates us to prohibit their use where the endangered Mission Blue butterfly is known to exist. The DEIR’s claim that NAP’s herbicide use will have no significant impact on the environment is apparently based on historic data from 2004 (which it does not share with the reader) and an assumption that historic use was in compliance with San Francisco’s IPM Ordinance. As we have shown, data from 2004 does not describe NAP’s present use, NAP is granted exceptions for most of its pesticide use, and NAP has a substantial public record of violating IPM policy. However, the DEIR is supposed to evaluate the environmental impacts of implementing the SNRAMP. It is therefore obligated to look forward, not backward. The DEIR tells us nothing about NAP’s use of herbicides in the future as a result of the implementation of the SNRAMP. This is the most significant failing of the DEIR because destroying thousands of trees will require the use of more pesticides. Most of the non-native trees that will be destroyed will resprout if their trunks are not sprayed immediately with Garlon. This initial application of Garlon is often insufficient to kill the roots of the tree. Repeated applications are often required to kill the roots of the tree. However, the DEIR provides no information about how much more pesticide must be used as a result of destroying thousands of non-native trees. We turn to the University of California at Berkeley for this information. UC Berkeley has been clear-cutting all non-native trees from its properties for over 10 years. Several years ago it applied for grant funding from the Federal Emergency Management Agency (FEMA) to continue its eradication of all non-native trees from its property. Quantify, evaluate and mitigate the increased pesticide use that will be required as a result of destroying thousands of trees that will resprout unless their stumps are treated with pesticides. If this information is provided in the final Environmental Impact Report it is unlikely that the EIR will be in a position to claim that there will be no significant impact on the environment resulting from the implementation of the SNRAMP. The animals that live in our parks and the humans who visit them therefore deserve the mitigation required to ensure their health and safety. Furthermore, CEQA law requires such mitigation.